Full name not firmly established in Street Fighter; from the United States. Height: 6'5", Weight: 252 lbs. See this page for Balrog's depiction in the Street Fighter games, animation, and live action. Accessories: black machine gun (92 Destro's), black rifle (90 Rock-Viper's), red spring missile launcher with black trigger (93 Astro Viper's), two black spring missiles (93 Astro Viper's), black spring grappling hook on black string (93 Guile's), black knife (88 Shockwave's), plain red pair of boxing gloves (87 Big Boa's), black figure stand (common). 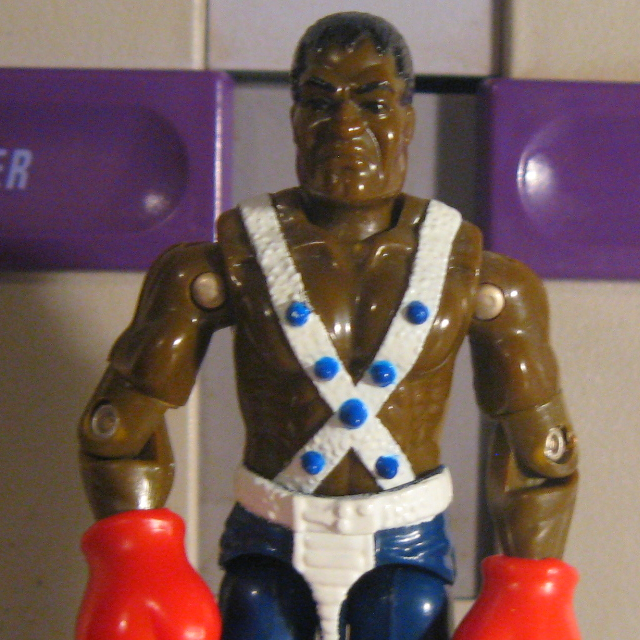 A former heavyweight champion, Balrog was barred from professional boxing after he ignored the rules of the ring. Wild and aggressive, Balrog now makes a living brawling on the streets of Las Vegas and occasionally picks up a buck as hired muscle for M. Bison. Subscribing to the theory that whoever hits the hardest wins, Balrog is all brawn. While he can be easily outsmarted, few fighters have his strength and tenacity. Motto: "My fists will have your blood on them." Toy Notes: Featured in the Street Fighter commercial. Item #81095.